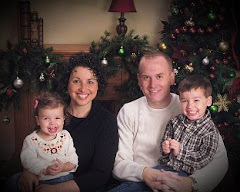 Jody at One Mom, Five Kids... has chosen this blog to recieve the Kreativ Blogger Award. Thanks, Jody!!! In return, I share 6 things I am thankful for and 6 bloggers who also deserve this award. 1.) My family - With my loving husband and 2 wonderful children, I feel like I am now whole. They bring so much joy to my life. 2.) Steady work - In this hard economic time, I am more thankful than ever that my husband and I both have steady work. 3.) Having our Finances under control - Again, with the hard economic times this is a huge weight off our shoulders. I know this can change at any time, but for now I am very thankful that we have our finances in order. 4.) Supportive Husband - Tim has always been supportive of what ever my heart pulls me to do - whether that's going back to school, changing jobs, starting my own business, staying at home with the kids, putting up with my mess... etc. 5.) Our home - We've been very lucky to buy and sell at the right time with our houses. The house we are in now is very much a home (messes and all). We are very comfotable here and I can see us building lots of family memories in this home. 6.) Our health and great insurance - My family is very lucky that we are all in good health. I am very thankful that if any thing is to go wrong, though, we have great insurance to help cover the expenses. Our current insurance is by far the best we've ever had. 1.) Kara @ Rockin Granola - Without Kara's support and great ideas, I'm not sure I'd be where I am today. She's introduced me to the world of frugal living, blogging, and so many other things that I am very thankful for. 2.) Marcy @ Stretching a Buck - Marcy has the best way to find deals, with lots of details, coupon links, and more. Her insight is very helpful. 3.) Stephanie @ A Year of CrockPotting - You have to love some one who commits themself to using their crockpot 365 days in a row. What I enjoy about this site is that it not only gives you great cooking ideas (with pictures), she also includes other creative ideas (like candle making). She provides comments and reviews of all her entries too, so you can make adjustments as you see fit. 4.) Mercedes @ Common Sense with Money - I started visiting this site for great Walgreen's deals, but then found it offers so much more. She gives great tips and ideas for getting the most for your money. I haven't updated my blog roll yet, but I do visit this site often. 5.) Melinda @ The Nest Egg = Again, I started visiting this site for great Walgreen's deals and was instantly hooked. I really enjoy reading her tips and ideas that go beyond the usual cicular surfing. She'll be coming to my blog rool soon too. 6.) Allie @ No Time For Flashcards - When I'm at my wits end with my toddler, I go surfing to Allie's page to find ideas for activities to do with him. He loves crafting and I'm so glad there are resources like this that offer so many wonderful ideas! thank you so much for thinking of me! I am touched; I'm having a lot of fun with this project.